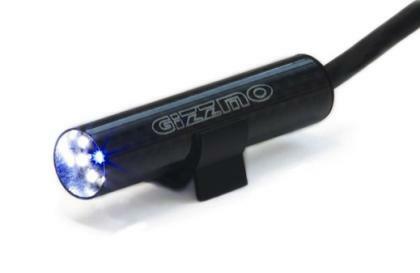 The Gizzmo DSII-L Launch is without a doubt one of the very best shift lights available today having a Super Tiny profile of 13mm X 61mm (.5in X 2.4in) and weighing a mere 55 grams (1.9oz) complete with loom. Within the 100% Carbon Fiber case is a full Microprocessor sampling your RPM signal in 16bit resolution at 0.0000045 of a second (222,222 times per second). The core difference between the DSII and the DSII-L is that the latter has a Launch Control feature and as such can interface with the Gizzmo Launch Interface. The other main difference is that the DSII-L has a White LED outside ring and a Blue center pre-shift LED. In addition to this there a 3 intensity settings so that you won’t get blinded at night or not see it on a bright summers day. The DSII-L also is touch sensed so there are no switches or buttons, you simply touch it with your finger and it will react immediately.